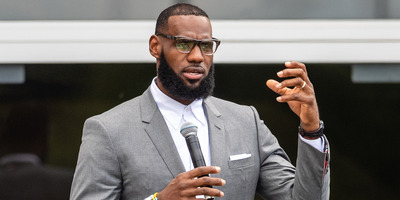 Jason Miller/GettyLeBron James’ new documentary series ‘Shut Up and Dribble’ will take a look at the role of athletes in the political and cultural climate of 2018. The series will examine the changing role of athletes in the political and cultural climate, and is set to premiere in October. The project is James’ second television project set to debut this year. LeBron James has been quite busy through the 2018 NBA offseason. Just a week after the opening of his new I Promise school in his hometown of Akron, Ohio, on Monday, Showtime announced that James is behind a new documentary series entitled “Shut Up and Dribble,” set to premiere in October. The three-part series will examine the changing role of athletes in the political and cultural climate of 2018 – a topic James knows very well first-hand. The title of the series comes from Fox News host Laura Ingraham, who used the phrase to criticise James for speaking out against President Trump back in February. James will serve as an executive producer on the series, which is being helmed by Gotham Chopra, who has previously worked with athletes including Kobe Bryant and Tom Brady on other documentary projects. “It’s really an exploration of how basketball is truly America’s game and the NBA has been a vessel for black athletes to claim pieces of the American dream,” Chopra told ESPN. The series is the second television project James is currently attached to, with his series “The Shop” set to debut on HBO in August. The show will feature James hosting wide-ranging discussions and debates with various guests and celebrities at barbershops. When he joined the Los Angeles Lakers in the offseason, many believed that James would become more heavily involved in Hollywood projects and other productions outside of basketball. With two projects set to premiere before he’s even put on a Lakers jersey, it’s clear that he sees his role as much more than an athlete.